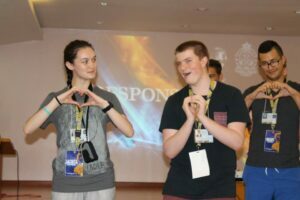 The Marist Youth Ministry (MYM) is one of Australia’s largest Catholic youth ministries, while the Sacred Heart College is an Australian Catholic school founded by Marist Brothers in 1897. Selected Marist Marikina students interacted with the Australians in a program held at the Marist Center for Music and Arts (MCMA). The program was bannered by performances from the Marist High Impact and Marist High School Singers, as well as students from kinder, grade 1, and grade 11.